Hey all! This is Chris. I’m taking the blogging reins to share the afternoon that the Epic family just spent together. My heart is so incredibly full as I look at how our family has grown through the years we’ve been a quartet, and today we welcomed another eight people to the fold….yup, eight. Susan, Grace, Katie, Anna, Jenni, John, David and Pete. Wait, whaaaaa???? Ok, let me back up. 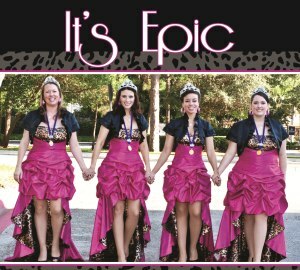 I know deep in my heart that Epic will be singing together for a long, long time. We have so much fun when we’re together we’ve traveled such an interesting path. I just know we’ll be in each other’s lives forever. In the last year or so, I’ve received a few invitations to sing in other quartets, all of which were very humbling. But in each case, with a heavy heart, I turned down the opportunity because I don’t want to be in another quartet; I’m in Epic. Then a couple of things…unexpected things….happened. First, my husband reiterated (repeatedly!) how our new chorus, Bella Nova, would benefit from having more quartetters on the risers. Then, one of my Epic sisters, Kris, said she would sing bass in a quartet if I would come along for the ride. Then, there was this beautiful family with the last name of Shields (that’s where the Susan, Grace, Katie, Anna, Jenni, John, David and Pete part comes in). Susan, the mama, is about the most generous heart I’ve ever met and she is SO EXCITED about barbershop. She is the walking equivalent of how we all felt when we first discovered the hobby. And then there’s Grace, the oldest of Susan’s six awesome kids, who is a stunning 14-year-old phenom that volunteered to help us out on lead. That’s how ReVoiced was born. A chapter quartet just looking to make some noise. For a few weeks now, that’s what we’ve been doing. And today, my two worlds collided. ReVoiced spent the afternoon coaching with Richard and then (after about three dozen hot dogs and burgers) Epic and some of the Epic families rolled in to clean up a few songs and lay some plans for future tunes. ReVoiced sang for Epic; Epic sang for wee David (the youngest of Susan’s six kids). There were puppy dogs and S ‘mores and harmonic chaos. It was truly my definition of a perfect day. I didn’t want another quartet. I was too nervous about juggling it all. I already had the friendship and deep, deep satisfaction that comes from having Anne, Kris, and Shana (Epic) in my life. But maybe I’m starting to understand how in the world it is that Susan has six (people…SIX!!!) children. There’s enough room in my heart and in my home for another quartet. And since Kris and I sing in both Epic and ReVoiced, it’s really only a quartet-and-a-half, right?? Whatever it is, it’s fun.